Jack loved the nursery visit with his mummy. He also liked painting, playing with mega blocks, learning about different people’s jobs AND celebrating Mrs Ward’s birthday at Whitehouse Farm. Afya loved Whitehouse farm with the cows and sheep. She also enjoyed playing with her friends. Flora liked the construction, home corner and using the computers. She also liked the library visit and the books. Emily really enjoyed being outside on the bikes and being at Gibside when she found stories in the woods. Rosa has enjoyed learning about pirates and dressing up. Alexander loved going on visits especially to Whitehouse Farm and seeing the REAL Santa! Evelyn enjoyed learning phonics especially when it is outdoors in Green and Orange zone. Ava loved Red Nose Day as she felt that everyone look funny!. She also thoroughly enjoyed making and eating the gingerbread man (where was mine????). However, Ava’s most favourite part of Early Years has been making lots of new friends! We totally agree Ava. Oakley’s best bit was the first day of starting school as he was super excited to make some new friends. 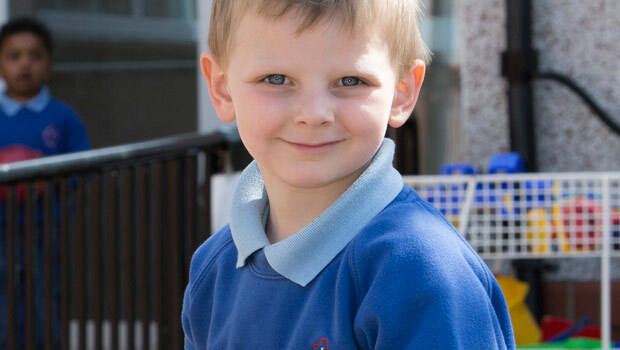 He is really proud that he has learnt to write good stories and has enjoyed learning all the different sounds to help with his reading and writing. Katie’s told us that her favourite memory (when she stopped laughing about it) was seeing Mrs Jones dressed up as Little Red Riding hood. Yes, the staff take part in all the dressing up days too! Zac also enjoyed watching the staff getting hit in the face with the cream pies on Daft Day – thanks, Zac. In the Early Years Unit, he has enjoyed his maths work and spending time in green zone. Kayode has simply loved EVERYTHING! Patrick enjoys number time whilst Katy thinks the teachers are just the best! ‘I like practising my handwriting,’ shouted Isabella.